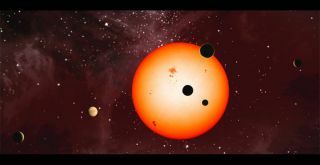 Artist's impression of Kepler-11, an example of a multi-planet star system. Scientists have been using data collected by NASA’s now-defunct Kepler space telescope not only to look for planets beyond the solar system but also to probe their parent stars, which pulsate as they spin, causing variations in brightness. The Kepler observatorycan detect these oscillations, much like it detected dips in target stars’ light due to planets passing by, or transiting, relative to the telescope’s line of sight. Working both types of observations, scientists have now found the first multi-planet system that is tilted out of alignment with the host star. The star, known as Kepler-56, is about 45 degrees out of alignment from the orbital plane of a pair of planets, which circle their parent star in 10- and 20 days respectively. Trying to determine what elbowed the planets out from the equatorial plane of their star led Huber and colleagues to a third, non-transiting, massive companion, which could be another planet or a star. “We think it’s responsible for causing this misalignment,” Huber said. The third, outer companion is inclined to the orbital plane of the inner planets. Scientists suspect its torque is tilting the orbital plane of the inner planets, with respect to the equatorial plane of the parent star. Follow-up ground observations are underway to figure out the third body’s orbit and size, information scientists need to determine whether it is a planet, a brown dwarf star or another type of star. “That is still a bit of an open question, but for the general conclusion of the theory of how this system formed it doesn’t really matter whether it’s a star or a planet. It just matters that you have a more massive companion in this outer orbit which can tilt the inner ones, which are much less massive,” Huber said. The research has implications for understanding how planetary systemsform and evolve. It also may help solve a long-standing mystery about how some giant planets settled into orbits far closer to their host stars than Mercury orbits the sun. These so-called hot-Jupiters were the first planets discovered beyond the solar system. VIDEO: How Do Astronomers Hunt For Exoplanets? “Some kind of dynamically disruption must have happened a long time ago that caused a planet to migrate so close to its host star,” Huber said. The new research shows orbital upheavals are not just limited to hot-Jupiter systems. “Such a dynamical tilting scenario had been recently suggested theoretically, and has now been observed for the first time,” astronomer Andrea Miglio, with the University of Birmingham in England, wrote in an email to Discovery News. Meanwhile, scientists are continuing to mine the Kepler data for evidence of other misaligned systems. The research appears in this week’s Science.